Leisure cruising along the Great Lakes and St. Lawrence Seaway has been an on-again-off-again industry for several decades now. But in the past few years, there is a much more intensive effort to make cruising a mainstay of Great Lakes tourism. Big cities, with their nearby airports and extensive transportation networks, make it relatively easy for passengers to arrive and depart from cruise ships. 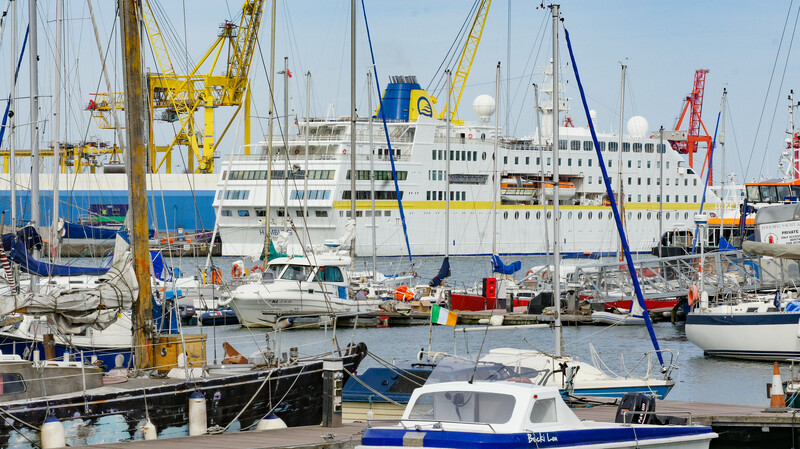 Now – with significant growth in the cruise ship markets — smaller Great Lakes cities that are not on current cruise itineraries … well, they’re having debates about how much to invest for a sometimes uncertain return. This week Great Lakes Now is bringing you the stories of how different, smaller communities are approaching the growing cruise industry. 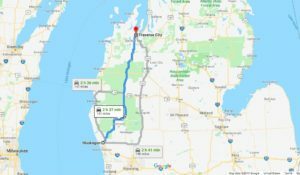 Some 150 miles north of Muskegon, Traverse City is a much newer destination for the passenger-cruise industry. In March the city and a coalition of municipal agencies – including the Traverse City Tourism, the Downtown Traverse City Association, and the Traverse City Chamber of Commerce – joined the Great Lakes Cruising Coalition (GLCC), an organization that represents American and Canadian coastal ports to promote passenger cruising. 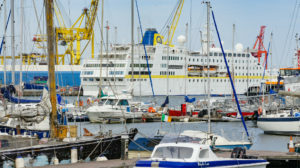 Like many Great Lakes would-be ports, Traverse City lacks the infrastructure to host most ships, For example, there is not adequate dock space with a wide enough berth for most Great Lakes cruise ships. Another impediment: there are backlogs for dredging the surrounding coast, and those projects will require more direct funding from the local community. The Army Corps of Engineers oversees dredging in the Great Lakes Basin, and while there has been more federal funding in recent years, the Corps still has to prioritize annual dredging operations for large ports like Cleveland, Toledo, Green Bay, and Duluth, as well as heed the input of Great Lakes states for other high-traffic, commercial harbors. 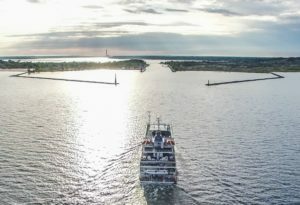 “One of the things that has been a challenge for the Corps is their inability to dredge non-commercial harbors, so smaller recreational harbors have not been dredged on a regular schedule now for a number of years,” said Tom Crane, deputy director of the Great Lakes Commission. A push for Traverse City to become a cruise destination doesn’t come completely out of left field, with Plantours’s MS Hamburg’s making a handful of stops during the fall season. Nevertheless, the city is banking on its well established sites on Great Lakes tourists’ agendas to give it a major boost in cruise tourism. With several nearby attractions, passengers have plenty to do on shore. 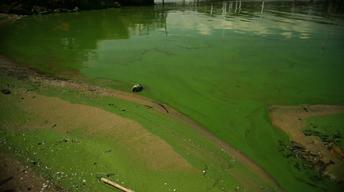 For example, the Discovery Center is just a 10-minute drive north of downtown Traverse City. 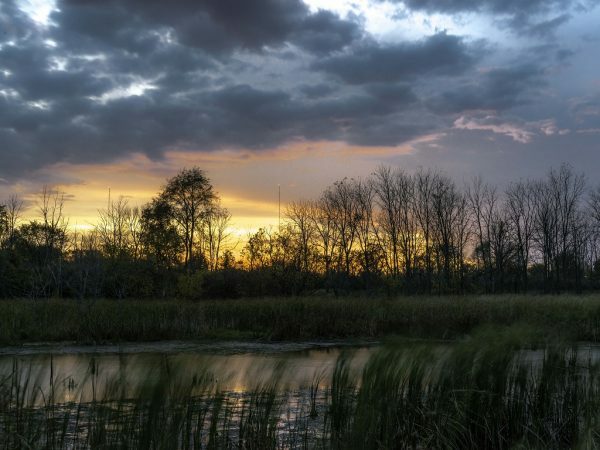 Situated atop a dock that was once used to offload shipments of coal, it features five freshwater based non-profits including the Great Lakes Children’s Museum and Traverse Area Community Sailing. “It’s a public fishing pier with access to really good fishing and deep water right off the edge of the pier,” said Mike Wills, president of the Discovery Center Board of Directors. 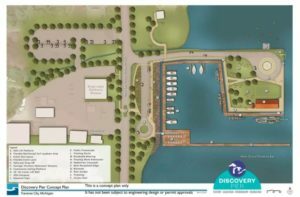 Incorporated in 2007, the Discovery Center and the GLCC have been working alongside one another to make Traverse City a feasible and desirable destination for leisure cruises. Docking at the port, passengers would be ferried to shore where they can then sign up for several types of excursions. 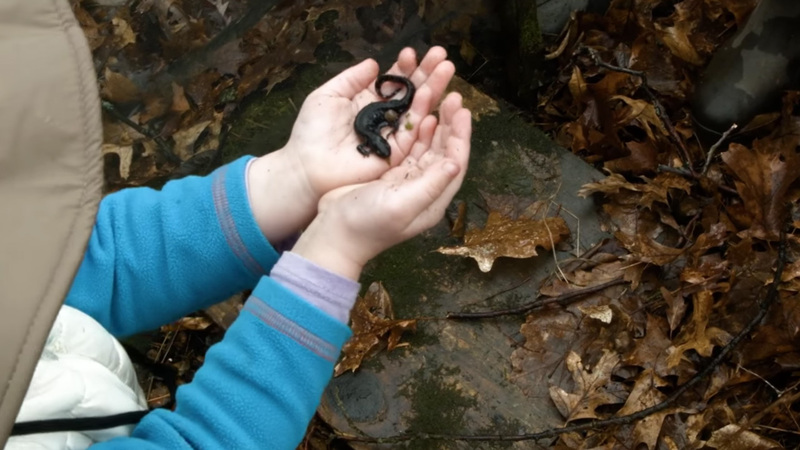 “Somewhere within a 45-minute drive, so they might go to Fishtown or Leland for part of the day, maybe grab lunch nearby, visit the lighthouse at the end of Old Mission Peninsula, that could be one excursion,” said Wills. 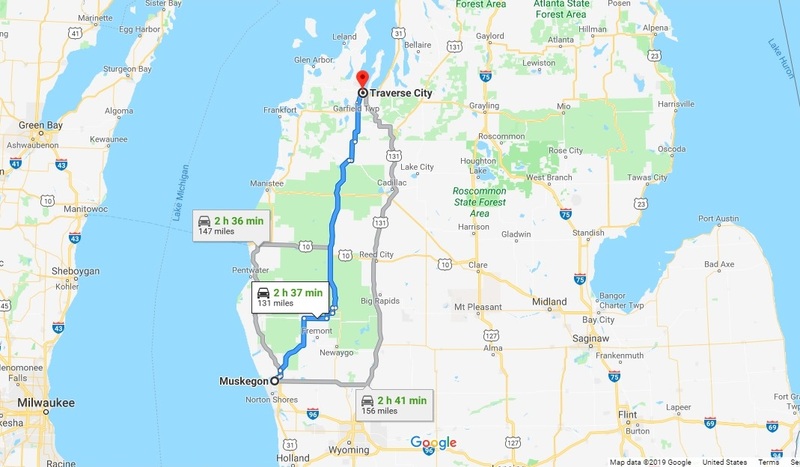 Talks between the GLCC and Traverse City have been going on for several years in order to lay the groundwork as a viable cruising destination, but the city only officially joined near the beginning of 2019, according to Stephen Burnett, executive director of the GLCC. Having so recently joining the Great Lakes Cruising Coalition, it will be another two to three years before Traverse City starts hosting new cruise ships. 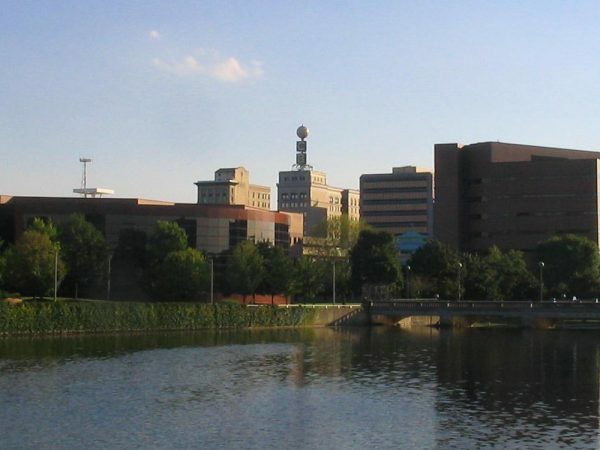 In the meantime, the city is pulling together the business community to provide the necessary funding, working with organizations like the City Commission (effectively the city’s legislative body) and the Traverse City Chamber of Commerce, said Wills. 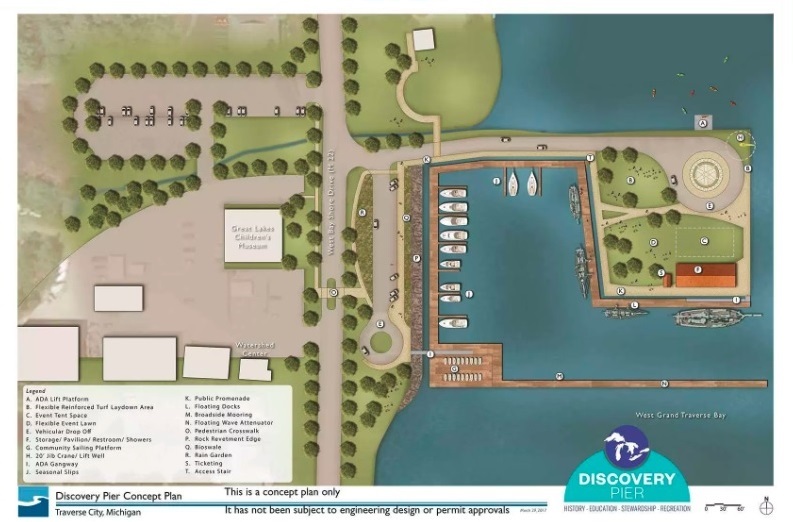 Beginning this fall, the Discovery Center will expand the pier, dredge the area to accommodate bigger ships, and begin planning the construction of a welcome pavilion with a shell-like architectural style reminiscent of Australia’s famous Sydney Opera House.